The night was a buzz from the get-go, people started lining up at 6:00 pm for this show. That is a two hour wait just to get inside the venue. The lineup was mostly filled with older faces, but scattered few and far between were the shiny eyes of virgin concert goers, ready to taste this musical delight. From my conversations with the people in line, they were all there for various reasons. Most of the older crowd was there for the Sammy Haggar and Michael Anthony angle. The younger crowd was a combination of Chad Smith and Joe Satriani. And sprinkled throughout the mass were people like me, just there to take in the pure mixture in its entirety. The first thing to note about the difference in this line, was the fact there were two lines. One was the regular line and the other was the VIP line, which was all older faces. Finally, after 2 hours of waiting, we were let into the show. The crowd filled the front of the stage instantly, which for those of you not used to this venue, is unusual. Their are seats and food at this venue so most often people don’t rush the stage until midway through the opening act. Not at this show, the crowd was on that fence instantly. The feeling in the air was the proverbial kid on Christmas eve, unable to bare the pure anticipation of what was to come. Seeing large-scale bands at small venues is the concert goers dream. The reasons behind this are pretty obvious, intimate setting for a bigger than life group, makes for unreal shows. After seeing Velvet Revolver at the Showbox in Seattle was a pretty sure this night would be up in the higher echelons of my concert memories and could barely contain my excitement. After the hour and a half wait the opening band took the stage, going by the name of Rich Hope and His Evil Doers. The look and feel of this band was a laid-back, 50s-bopper styling with blues and southern undertones. Two guys were on the stage, which is a direct correlation the southern styling, no bass just a guitar player/singer and a drummer. They had a very blues driven sound and basic rock styling which was eaten up by the mass instantly. I was in awe of the band from the beginning and would see them live again anytime they come back. They stated their album wasn’t going to be out for 2 more months, but I will be looking for this online as soon as I can. The singer had a great banter with the audience, and spoke mostly of vinyl collecting, and his love of Wild Turkey. Minimal lighting effects made this a simple start as opening bands usually do, but this worked well with their minimalist attitude. After the departure of this great up and comer, the mass started to engorge with more people flowing in through the doors. The latecomers and such a venue are full of people who make lots of assumptions and this group was no different. People started walking up front to the side of the huddled mass waiting at the fence for their idols to take stage, and tried to push there way in. When no one lets them through, they always say the same thing, “Why won’t you let me past I am trying to get up front”. Which in turn is always responded to with a similar answer, something along the lines of, “if you really want to get up front, don’t show up 2 hours late”. People wait a long time in line to get the privilege of being up front, and shouldn’t be asked to share it with the people who don’t plan ahead. Even though this is something, I think, that should be simple concert etiquette it is rarely observed. There are a few show types that this does not apply to, but seeing someone of this magnitude definitely should increase the need for people to follow these concert rules. 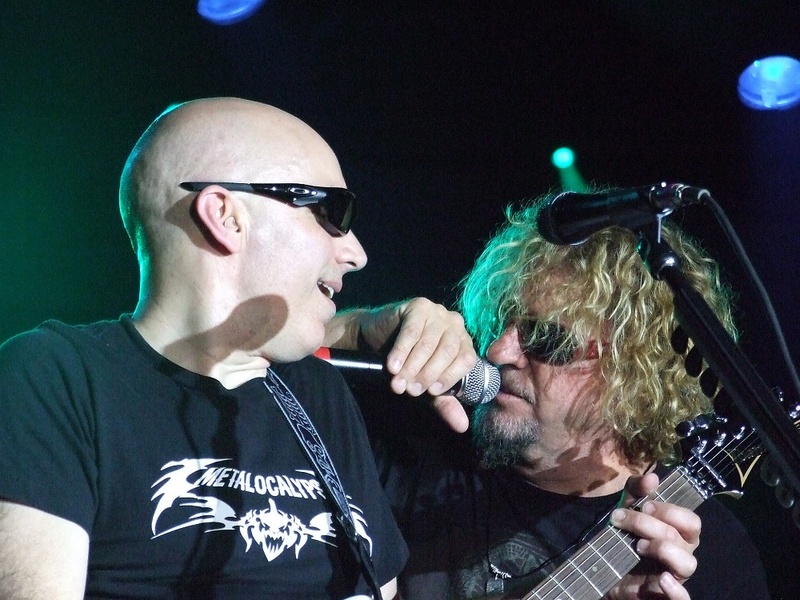 After the long wait and delightful audience conversations, Chickenfoot took the stage. From the get-go they were high energy, and jumped right into one of their three songs that have been released on-line. Sammy was full of piss and vinegar, running around like a madman on stage. Smokin’ Joe was on fire, playing some tasty, extra crunchy riffs. Chad Smiths unreal backbone beat was the heart of the sound and he lit those skins up like a man possessed. Michael Anthony was grinning ear to ear and loving every minute of this show. Their sound live was heavy and deep, but had great subtlety in every way. Some songs would be heavy with bass and guitar riffs, and the subtleness of the drums would support the whole thing. And this dance of heavy and subtle would fill most songs, making every level of each tasty jam deep with complexity. The lighting for this show was great, filled with cone lighting, bar lighting and back lit light panels. This made for a great feeling of excitement, that lit up the eyes of every fan in the building. There were no fog machines or unifying costumes for this group. There style was that of a garage band, all wearing jeans and rock inspired shirts. Everything fit well with their stage show, and their uneasiness through songs they hadn’t played much was evident. The musical integrity of every song was pure and backed with pure effort and expertise. The only issue there was, that I could see, was Sammy having to look to the floor to see the lyrics of a couple songs. For a band that hasn’t been together that long, this isn’t uncommon, but let it be known that at no time, did Sammy miss a lyric or ruin any song. They were professional and coordinated, and made a great show come to life with their energy, determination and pure rock n roller attitude. Throughout the show the crowd interaction was perfect, from Sammy high-fiving with them, to Smokin Joe flinging picks to the masses, to Chad Smith and some on-stage vocal antics, they had us in the palm of their hand. The mass at no point got out of control, i mean there are always the occasional drunken buffoon who tries to wreck it, but at this show it was addressed instantly and never affected the musical ambience or the mood. My overall experience at this show, was perfect. Very rarely does a show captivate me through its entirety and keep me wanting more. At no point through this show did I find myself thinking about anything besides what I was seeing. Sammy bought my vote during the last half of his set he reached out and high fived me, then he took the wine glass full of tequila he was drinking and handed it to me. I grabbed that glass like an eager 16 year old at his first show and took a big ol’ swig. Even though I am not much a drinker, you cannot deny someone like Sammy the passing of the goblet. My vote was later secured again when Joe Satriani flung one of his picks at me, he then pointed at me and smiled. I almost lost the pick as it bounced from my grasp, but the security guard there was nice enough to pass it back to me. Again the show was great, and the interaction with he crowd sold it for me. The music was great live but I fear the album may ruin it a little, as this music is the type that is way better live than contained, but time will tell. This band doesn’t even need an endorsement, they are a supergroup and are a must see regardless of what I say. But like I always say, if you want to see more music from any group, don’t worry about the album. Just get out there and see them live, its a win-win for both sides and definitely shows your support for them. Seeing a band like this is a magical feeling, rarely do these supergroups work out, and I wish them a long time together. Usually, the egos in this type of band will ruin it in its infancy, but I hope to see these guys progress through 2 or 3 albums to really see what they can do. I would give this show 4.5 out of 5. On a final note, they did say they would be back in September so we will have to wait and see if we get another show announcement in the next few months.